Available with lots of personalization options, this CD to MP3 converter allows you to set audio effects (incl. fade-in/out, normalize, band pass, chorus, flanger, echo and speed), convert one audio track to multiple format music files at once, split audio tracks, clip music segments and so on to personalize your outputted music files. 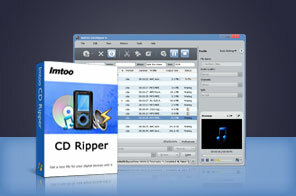 Download this amazing ImTOO CD Converter for a free trial now! Convert CD Soundtracks to Music FilesConvert CD to audio files of different formats including MP3, WMA, WAV, AAC, FLAC, OGG, APE. Batch ConvertingAbility to convert multiple CD tracks at once; convert one track to multiple format audio files simultaneously. CD to iPod/iPhone/PSP TransferMakes it possible to transfer audio files to iPod, iPhone and PSP directly after converting CD. Audio effects available include fade-in, fade-out, normalize, band pass, chorus, flanger, echo and speed. Set the effects as required to get customized music files. Split a single track into several parts automatically by presetting a split mode. Extract your beloved audio segments from CD tracks and convert them to audio format of your choice. Customize the outputted audio files by setting the output parameters freely; edit ID3 tag info of your audio tracks. The great support for multiple CPU cores and multiple threads maximizes the CD convertingspeed. Run the CD convertingin the background to spare CPU resources for others. Convert audio from OGG to MP3 and OGG to WAV, convert among audio formats. Convert popular audio files including MP3, WMA, WAV, M4A, OGG, etc. All-in-one audio converter, CD Converter and audio CD burner together. Extract audio from almost all video files with excellent quality.